Our hydrovac trucks are operated by experienced professionals. Our operators are thoroughly trained and skilled at performing non-destructive excavating. Whether a client is from the oilfield, industrial, agriculture, commercial, or residential sector, our staff will be able determine the right method of hydrovac service needed. You can excavate without damaging your underground utilities. Hydro excavation is a non-destructive method of digging up what’s below the surface, such as buried lines and pipelines. By using water to break up the earth and a vacuum to remove the mud, the hydrovac unit effectively eliminates the potential for utility strikes, damage to equipment, and ruptured pipes, which could lead to environmental disasters and hefty repair costs. Looking for hydrovac services? Our team is ready to serve you! At Elite Vac & Steam, we intentionally stock our fleet with high-capacity units capable of handling almost any job. In-house mechanics and highly trained operators keep each piece of equipment clean and in impeccable condition, ready to serve you better. At Elite Vac & Steam, we offer both code and non-code hydrovac units, allowing us to haul dangerous goods that regular non-code equipment can’t legally handle. 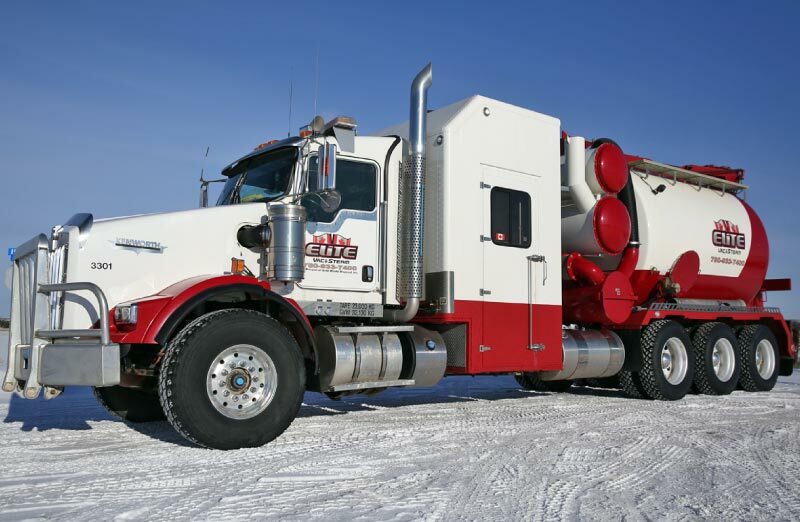 Our hydrovacs have high capacities to haul your water, debris and waste in Grande Prairie and Northern Alberta. *All trucks are equipped with grounding mats and oscillating nozzles for exposing energized power lines. *All operators are fully trained and orientated to work for all major oil and utility companies. We have two main locations in Grande Prairie, & Peace River but we service Northern Alberta, British Columbia, NWT and beyond. Call us today! We would be happy to serve you with our state-of-art hydro-vac units.